Stories of hardship and hope are immortalised in a new book celebrating the 45,000 youngsters BUSHkids has helped over the past 81 years, writes SHERELE MOODY. THE cool ocean breeze tickling his skin, toes sinking into sand, salty ocean waves dancing around his legs, baked beans tantalising his tastebuds and bagpipes singing in his ears. Some 56 years ago, a little lad called Trevor Stewart bid his parents a sad farewell as he embarked on a 15-hour journey from his family's farm in Queensland's Gulf Country to the thriving metropolis of Townsville. Little did he know that the moment his six-week adventure in that far-off city started, he began making memories that he waxes lyrical about today. It was a momentous trip for the boy from the bush, who until 1960 had spent almost every waking hour helping his mother, father, brothers and sisters eke out a living growing cotton, corn and peanuts from the hot dry savanna they called home. The Stewarts lived a tough and isolated life at Tonks Camp, once a staging post for Cobb & Co's horse-drawn coach services travelling through the region. They had no car and that meant getting to school in Georgetown - some 50km away - was not an option, so the children completed their lessons around the family dinner table using the distance education curriculum. Hanging out with the neighbourhood children was rare because the nearest family lived about 10km down the road. Fun for the five brothers and three sisters revolved around hunting wild pigs and other feral pests that threatened the family's crops. After the sun went down and dinner done and dusted, Trevor and his siblings gathered around their father who entertained them with bawdy jokes and stories from his childhood. Speaking to Trevor about his youth, it quickly becomes clear that his first and only childhood trip to the big smoke was a great adventure for a boy who rarely stepped beyond the boundaries of his home land. In fact, the six weeks he spent at the Royal Queensland Bush Children's Health Scheme's (BUSHkids) Townsville Rowes Bay centre takes pride of place in the now 67-year-old Bundaberg-based bush poet's repertoire of verse and song. Children soak up the sea air during their stay with BUSHkids at Emu Park. BUSHkids has been helping regional Queensland children receive vital medical care for 80 years. 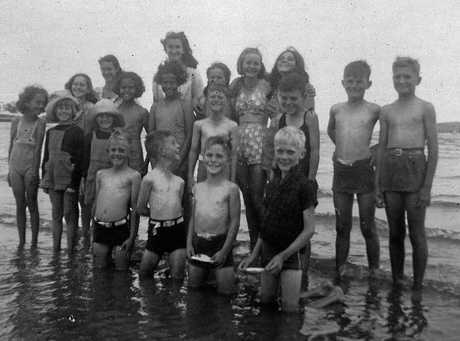 "We were made welcome and the people were absolutely wonderful," Trevor recalls, the memories of his only childhood adventure by the sea as bright today as they were almost six decades ago. "I can still remember baked beans on toast and going down to the sea. "I'd never seen the sea in my flaming life before - it was this river where you couldn't see the bank on the other side. "There was a great big sandpit and you'd dig down that deep that the thing could cave in and you could get suffocated, but we knew no different so we'd keep digging down. "We went out to this place one night to see the Scottish sword dancers - I can still see them as plain as day and hear the bagpipes." Trevor made many friends at Rowes Bay, but one particular girl left a major impression on the lad's heart. "Her name was Barbara - she was the highlight of my trip," the now grandfather says of the moment he fell in love for the first time. "Nothing eventuated, I was disappointed - she never knew I liked her." Trevor's stay at Rowes Bay also meant he could have important medical and dental check-ups that he missed out at home because of the remoteness of the family farm. 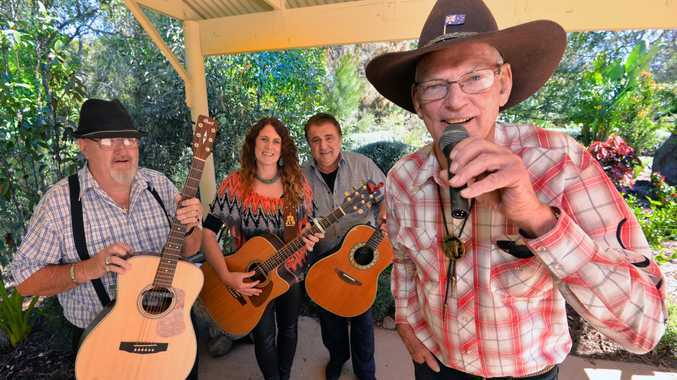 Having worked hard for almost all of his life, and having raised three children with his wife Libby, Trevor plans to spend his sunset years travelling around Australia reciting poems about living the Aussie bush life and playing his favourite country music songs for audiences of all ages. Thanks to that 1960s childhood getaway, Trevor's poetry has been immortalised in BUSHIES - a new book celebrating the 45,000 youngsters BUSHkids has helped over the past 81 years. It took Matt Tesch, Pat Carlin, Adrian Harrison and a small team of volunteers three years to make the book a reality. 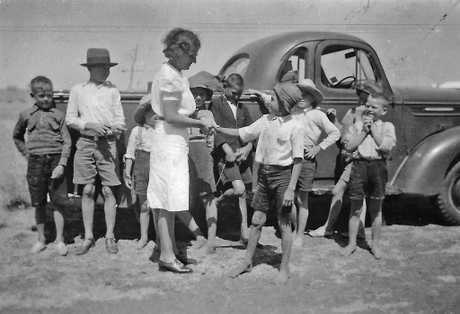 BUSHkids kicked off in 1935 to provide vital support and social opportunities for isolated rural and regional youngsters, many of whom had serious medical needs and/or disabilities. 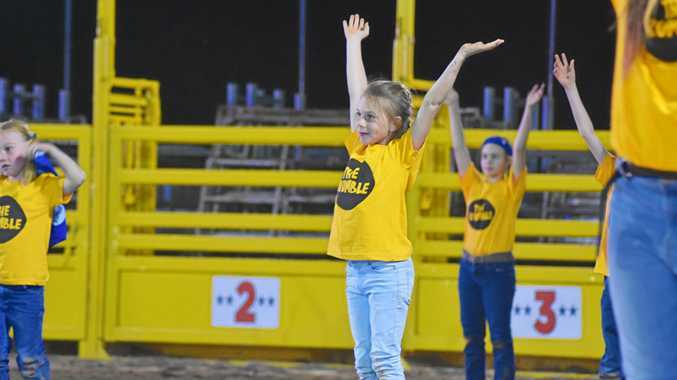 The youngsters would travel from all over the state to soak up the recuperative benefits of salt water and fresh ocean air at beachside homes in Maryborough, Yeppoon, Redcliffe, Townsville and Hervey Bay. These days, BUSHkids staff are based in offices across Bundaberg, Dalby, Emerald, Mount Isa, Warwick and Inglewood, providing speech pathology, occupational therapy, clinical psychology and family health support. Just a few weeks ago the organisation released a book featuring the stories of about 50 people touched by the service. Trevor contributed two poems to the publication - Springtime in My Childhood and Bush Children at Rowes Bay in the 60s. "Take my hat off to the founders of such a wonderful scheme: 80 years ago had foresight to commence the unforeseen. My trip in the early 'sixties: I'm so grateful (and how!) recalling the good times then, and reclaiming fond memories now," reads a verse from one of the poems published in the book. Like Trevor's story, all of the tales in BUSHIES highlight the important role the organisation played in individual lives. Jandowae resident Shirley Walpole - who at 81 is just two weeks older than BUSHkids - recalls heading to Brisbane on a steam train from her home in south-west Queensland with her little brother Robert and six other children. "It was a big adventure and I was the oldest of the group so, because I was a bit bossy at school, I think I was supposed to keep everyone in line," Shirley says. "It was my first time away from family, really, and everyone was so excited about going all this way to Brisbane that they wouldn't have played up anyway, in case they got tossed off the train. "We didn't know where we were going but we knew it must be somewhere special. "The food was always great, better than we had at home, we helped with the washing, and often used to go out for a ride on a boat." Blackall’s Meredith Henson spent a lot of time at BUSHkids’ Yeppoon and Redcliffe homes where she received important health and surgical care punctuated by frolics in the sea. Blackall's Meredith Henson was born with Mobius syndrome, an extremely rare congenital neurological disorder causing facial paralysis, including restricted eye movement. Meredith spent a lot of time at BUSHkids' Yeppoon and Redcliffe homes where she received important health and surgical care punctuated by frolics in the sea. "In one of my families I was one of five (children) and in the other family, at Bush Children's at Redcliffe, I was one of 55 (children)," she recalls in the book. "I got to play on the beach every weekend - my family didn't get that." The team interviewed 50 former clients, volunteers and staff and waded through 8000 historical documents including photos, negatives, recordings and scrapbooks, many of which were found in "dusty box after incompletely-labelled dusty box". "Sadly, many key people's first-hand experiences with BUSHIES - as the organisation was traditionally known - could not be tapped into because the march of time took them from this life even as we were reaching out to make contact," Matt says. "But in a number of instances, surviving family members and descendants have been incredibly generous with their memories, time and memorabilia. "There seemed a great sense of relief that their loved one's stories of their time are told in BUSHIES. "And there's no doubt that the hundreds of images between the covers of BUSHIES is going to be a real treat for readers. "From fascinating historical scenes to uplifting success stories of kids restored to good health, from poignant memories of people who are no longer with us but who left an indelible mark on many hearts by their presence to rare insights into how such an enormously complex, statewide operation worked, BUSHIES is a visual treasure trove in its own right." BUSHkids CEO Carlton Mayne says it was no easy task digesting 80 years of service to the Queensland community into 440 pages. "This turned out to be a massive exercise," he says. "The resulting book is a magnificent testament to the vision of our scheme's founders and the spirit of many generations of Queenslanders who have stayed true to the goal of providing necessary care to rural, remote and regional families despite all the changes and challenges over eight decades." 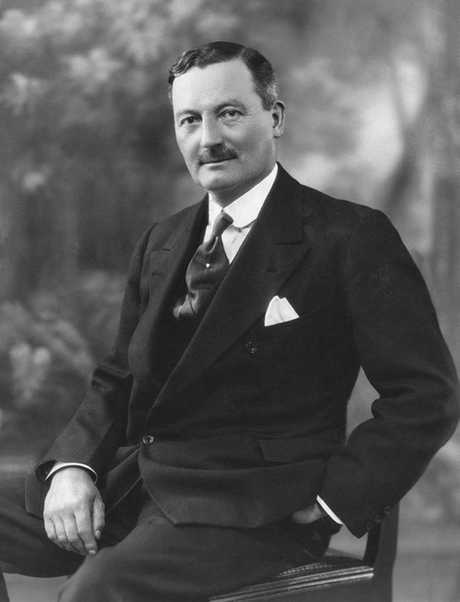 In the 1930s, Queensland's 15th governor, Sir Leslie Orme Wilson, and other concerned community members formed the Queensland Bush Children's Health Scheme to help combat widespread health problems, malnutrition and medical conditions for regional and rural children. On December 6, 1935, the scheme launched and was funded entirely by public donations. By the 1950s, coastal BUSHkids homes were operating at Redcliffe, Hervey Bay, Yeppoon and Townsville. A network of community representatives, district branches and committees were established to support the homes and transport groups of 30 kids at a time for six-week stays at the facilities. Doctors, dentists and surgeons volunteered their time and skills to help the young patients. Children with more serious cases were flown Brisbane for specialist surgery, returning to complete their rehabilitation at one of the homes. As Queensland headed into the new century and medical services were expanded into regional Queensland, BUSHkids began closing its coastal homes because there was no longer a need to bring kids to the coast or Brisbane for treatment. BUSHkids began offering support to regional and rural children with behavioural and developmental issues, speech and learning disorders, the first diagnoses on the autism spectrum - and new research and strategies developed. BUSHkids now has offices in Bundaberg, Dalby, Emerald, Mount Isa, Warwick and Inglewood providing speech pathology, occupational therapy, clinical psychology and family health support.